Knit ribbing rows 1 - 4 (1- 4; 1 - 4 and 1 & 2; 1 - 4 and 1 & 2; 1 - 4 and 1 & 2). Transfer work back to your 16" size US 10 needle. Now we're going to be working back and forth from the break, although we'll continue to use circular needles. We're going to begin with some decrease rows, as follows. 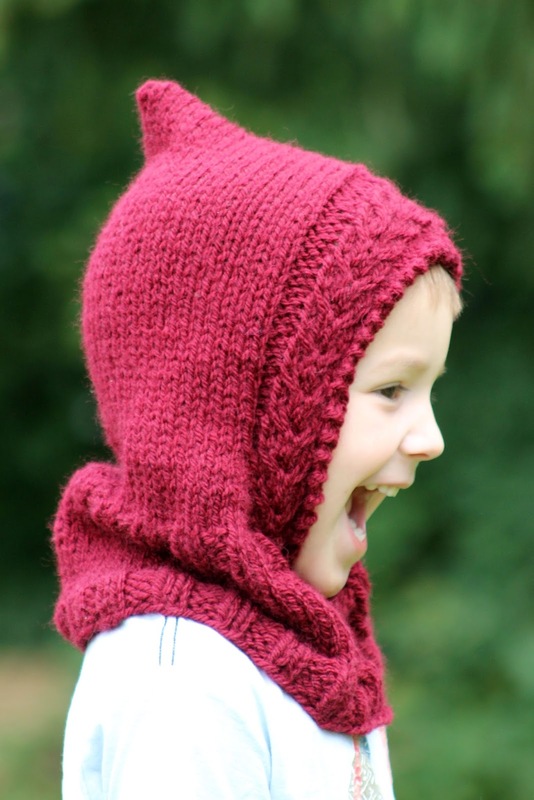 If you're knitting the toddler or the 4 - 6 size, you'll begin with Decrease Row 1. If you're knitting any of the larger sizes, begin with Decrease Row 3. Knit decrease rows 1 - 4 until you have 54 (58; 62; 66; 70) stitches left on your needle. Then resume the main pattern, which you'll find below, beginning with the appropriate row (e.g. if you reached your stitch count on Decrease Row 2, you'll begin with Row 3 of the pattern below). Knit rows 1 - 4 until portion above the neck ribbing measures 8.5" (9.5"; 10.5"; 11.5"; 12.5") and you've just finished row 1 of the pattern. 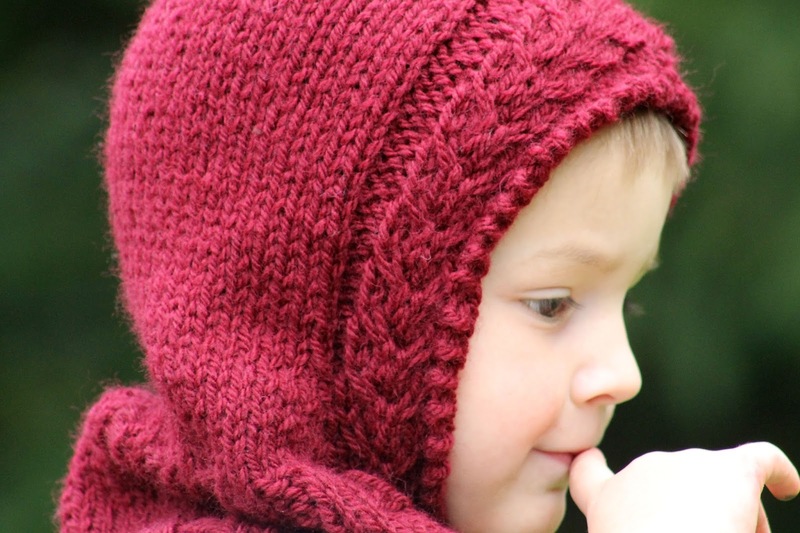 Bind off loosely and then seam, or bind off and seam at the same time with a three needle bind off. Tuck in ends and block. This is so adorable! I don't have any kids of my own (wish I did) - but I can think of some nieces and nephews that could wear it!! Thank you for sharing. Very cute pattern. Will you send me the model please? What a smile! I'm working on this right now; am doing the decrease rows. Puzzled as to how the hole for the face is going to be made and the hood itself. Is something missing? It's all making sense now, I'm loving this pattern. 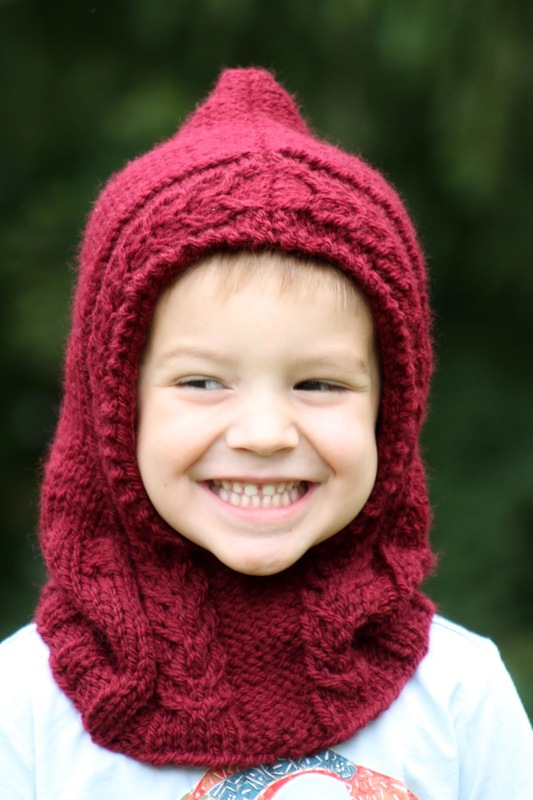 One more question, when the pattern says to knit rows 1-4 until 9.5 inches above ribbing for size 4-6, is it talking about the ribbing done at the very beginning of the hat? 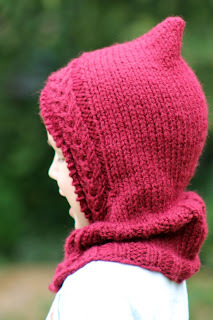 Or the rows of ribbing that were done just before starting the hood? can this be modified to fit an adult. I do not understand your gauge.Gauge: 14 stitches = 4 inches Don't we need the number of rows to make 4"
Love the pattern. An thinking of knitting a toddler size for my soon to be 1 year old grandson. My concern is that because our winters are very cold..... Will the opening for the face be tight enough for the ears to be completely covered. I like the bear hat too but that opening definitely looks too loose. Hi there! Of course that depends somewhat on the side of the child's head (in my experience, that's about the age they start getting a lot bigger), but my best guess is that this will work. If it seems too big, however, you could always pick up stitches along the face hole as well to make it more snug! Hi! I love this pattern! I am making the adult size and am beginning the decrease row where I will no longer be knitting in the round but will work back and forth. I have completed the previous rows 1-4, 1-2. So I will start decrease row 3. However this appears to be a wrong side row and I am on the right side (have been all along since it is in the round). Can you please clarify for me? Thanks and again, this hat is adorable! Yes, I understand now. Thanks for your quick reply! Hi! I also love this hat!! I would be making it for s 2 yr. old. I know you mentioned about picking up stitches around the face if too loose. Is there any way to give me a few pointers on how this is achieved?! Not very familiar with picking up stitches!! I'd hate to make this hat and have it be too big for his face. Any help you could give me would be greatly appreciated!! First off, if you're making the toddler size it should be good for a two-year-old! 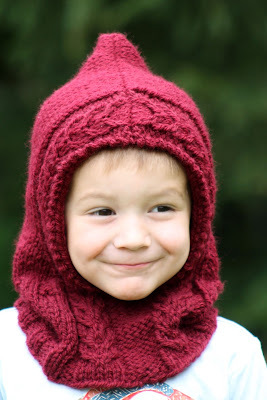 :) However, if you're concerned then you can simply do some measuring & math - specifically, use your fabric tape to measure around the child's face to determine how you'd like the hat to fit around the face. 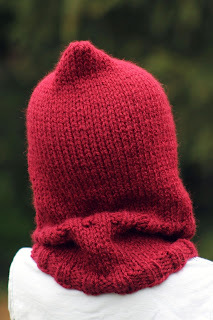 Then, you have two choices - first, you could adjust the pattern to be the right size (as written, the face hole will be roughly 17" around - you can adjust the size by knitting to a measurement bigger or smaller than 8.5" as you see fit. Then you will have to pick up the correct number of stitches around the hole by simply double-checking your gauge and doing the calculation for how many stitches you need for the length). Second, you can skip the step of adjusting the length and instead just pick up slightly fewer stitches around the face hole if you want it to be smaller (for instance, if you pick up 3 stitches fewer the face hole will be just under an inch smaller in total, so more like 16"). Thank you sooo much! Got my yarn today and I'll start this evening!!!! Good to hear! :) Let me know if you have any questions!!! 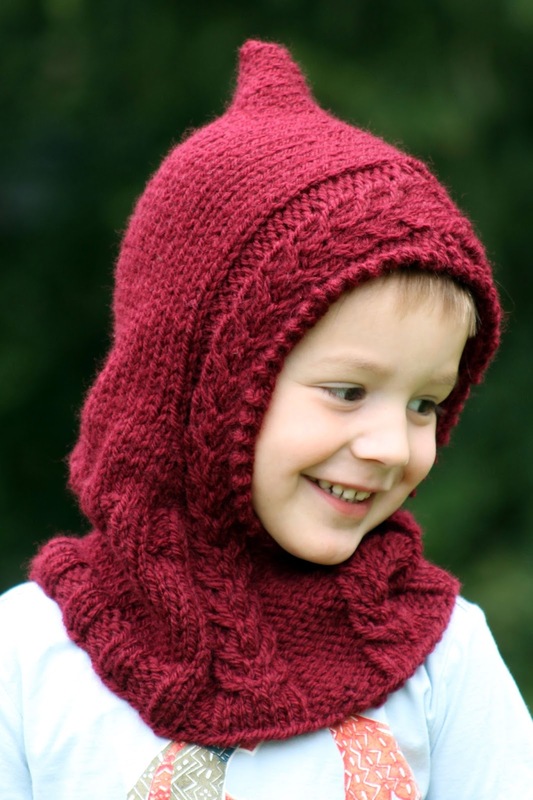 To make one for a 1 year old or younger could we not just use finer yarn and smaller needles? Yes you could! :) If you're interested in trying and need help with the conversion, let me know what age child you're making it for and I can help! I have a question_ ON ribbing rows 1-4 above - do I do the rows 1-4 listed outside the parentheses plus the stuff listed inside the parentheses or only the instructions inside the parentheses?? I'm hoping to use a nice wool roving - it's listed as "Bulky - 5" w 15 stitches and 20 rows to get a 4" square - and wanted to make the Adult Small - am I going to have to increase the needle size and decrease the # of stitches? If so, can you advise? Thanks so much, Gretchen, I'll go for it! :) Thank you! Well, one year later and I've finished it for myself - it's adorable, and my family loves it, too! I ended up using the size of needles listed, the adult small pattern, and accidentally added an inch or so to the height of the hood (measured from base of opening instead of top of ribbing, but it made it perfect! My husband thought I was going for the European look, and referenced "Heidi." I'm going to make some more for my daughters, soon. This is a wonderful pattern! I loved the three needle bind-off, too - it worked so well! Thanks again! Hey, better late than never!!! :) And I'm so glad to hear that it turned out well - the three needle bind off is a wonderful tool. Glad you like the pattern! Hi Gretchen, I am making the Adult large and cast on 82 stitches as shown. However, when I get around to the last 13 stitches I find I will have 4 knit stitches together as I start the last 13 stitches thus breaking the k2 p2 rib pattern. Is this correct, or should there be either 80 or 84 stitches to start? Oh my gosh, you're totally right! I actually can't believe how many projects I've seen for this pattern without this coming up before. :) Anyway, I apologize, and I'll fix it. I think casting on 80 would be perfect (although of course you can go with 84 if you want it to be extra large). I went up to 84. I haven't gotten to the second round of ribbing quite yet, but I think 84 will work for me. I may do another one at 80 to see the difference. Thanks for the reply! Hi, is it possible to knit this pattern for 2yr old? What should be the number of stitches? I am loving this pattern.. I was wondering that if I was to use worsted yarn (making size 4) would I just go up a size so it will turn out to fit size 4? I hope I explained this correct. Thank you kindly, your so amazing to help. I was also wondering about the blocking. How do you lay it out after heming the top? Do you have a picture I could see. Hi! Unfortunately I didn't take pictures while blocking but I just folded mine along the top seam so that the back of the hat was at one edge and the face hole was at the other. Hope that makes sense! :) Also, remembered to send me your gauge if you still need help with the modification! Thank you this makes sence. Yes the gauge for he #4 medium yarn. It says 18sts at 24 rows=4inches with #US 8 or 5 mm hook. I think I will use this yarn to knit two for my 12 month old grand daughter and grandson.. We have 9 grandkids and jus finished two for out twin girls.. Thank you Gretchen, you truely are a blessing. 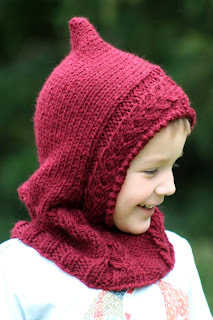 Question - in this part - Knit ribbing rows 1 - 4 (1- 4; 1 - 4 and 1 & 2; 1 - 4 and 1 & 2; 1 - 4 and 1 & 2). Transfer work back to your 16" size US 10 needle.